One substantial piece of advice for both aspiring and experienced translators, especially literary, is to read widely in your source language. For me, that's French. And since I focus on literature, books are best. Or at least, significant. It's also just as important to keep up with current affairs. And again, for me, that's the world of books. The new releases, the new short stories, the new authors. So for these, literary magazines are best. But as you can imagine, French literary magazines are hard to find in the States. Pretty thin on the ground. ("Just generally pretty trim," as Eddie Izzard would say.) So now that I'm back in France for a few months, I figured it was high time to root some of these magazines out. Which is, of course, easy enough, once you've gone to both a librarie (bookshop, in English, not a library) and a tabac presse (basically a glorified newsstand mixed with the checkout shelves at a grocery store) and had extensive conversations with the employees. LiRE (March issue): This magazine has it all. Released by the same company as L'Express (a weekly news magazine), it's bursting with news, features, thematic segments, reviews, five excerpts from upcoming novels, a couple interviews, and editorial content. It covers French books, foreign books, historical non-fiction, scientific books, essays, graphic novels, YA and children's lit, paperbacks, the works. And everything in this issue is well-written, engaging, varied, intelligent, and well-thought-out, no matter how short. It should be extremely useful both in following industry trends and reading new fiction. Le Magazine Littéraire (March issue): Maybe I shouldn't have read this directly after LiRE. All I could do was compare the two, as they both purport to serve the same purpose...and this one fell at the other end of the spectrum. The content wasn't as varied. There was only one excerpt, and it was middling. The news seemed stale, or not expansive enough, or devoid of emotion. The thematic content (this month: vampires....wheee.....) overshadowed everything else, and didn't leave enough room for what I really cared about. Even the layout was grating. I was disappointed when I tossed it into the trash can (no recycling here), but not too sad. Le Tigre (March issue): This is an interesting magazine. I almost didn't grab a copy because their editorial mission includes the warning that they don't publish fiction. But no matter; this is a fantastic selection of artistic prowess. Wordplay, photojournalism, illustrations, and twisted essays thrive alongside each other. One spread takes a roadmap, marks out a few towns that have "real word" names, and makes sentences out of them, haunting and sad. I've also just discovered that all their archives are free online. Looks like I won't be reachable for the next week while I read ALL OF THEM. Marianne (April-May issue): Not actually a real thing, for these purposes. Neat idea, though: an extra publication from a weekly news magazine, treating a different subject every issue. This time is death. Very bright and happy, I assure you. But it's more of an anthology from older, established texts. Interesting, but unhelpful. 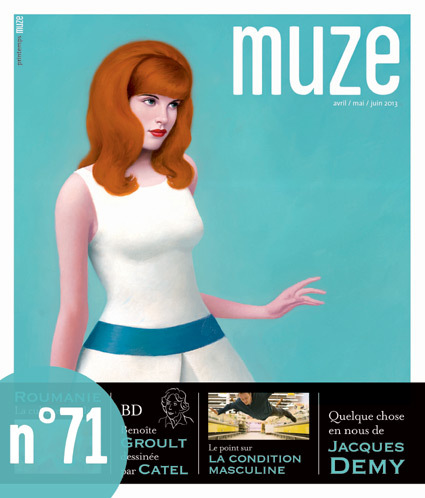 Muze (Spring issue, April-June): Oh, how lovely this thick tome. Technically a female-oriented cultural revue, this journal really has its finger on the pulse of life. It seems. Everything includes a healthy dose of analysis, which I started skimming when it turned too philosophical, but it doesn't detract from the wonderful behind-the-scenes look we get at every single topic the journal undertakes. Every theme includes current happenings, cultural tie-ins, movies, psychology, art, poems, and fiction. And the physical thing is a beauty to behold. The cover is even embossed. A tactile and visual dream. Definitely going on the list of not-expensive-enough-to-prevent-me-from-ordering-an-international-subscription. Longcours (Spring issue): Also a very pretty, thick journal. But, as I realized when I started reading it, dedicated almost exclusively to long-form journalism. Very well-done long-form journalism, from what I've read. But only one short story. And although it was fascinating, that one thing is not enough to warrant a subscription. Still, I'll be flipping through it whenever I walk into a French bookstore. XXI (Winter issue): Ditto the above, with a heavy sigh. Really well-done long-form journalism (has apparently won scads of awards), including graphic novel journalism, but not what I'm looking for right now. Kudos to them on their Manifesto for a new media, though (if you understand French, it's a good read). So in the end, I've got at least three that I'll be subscribing to upon my return to the States. What about you, lovely readers? Do you know of any others? Did I forget your favorite? Fall in love with your worst nightmare? Tell me what I've missed.